Heading west by small plane from the East Coast, writes James Fallows ’70, “you have a sense of going uphill, and into drier air. Mile by mile you leave behind the forested hollows of the Appalachian slopes, the farms and gently hilly pastures of southern Ohio and Indiana, the flatlands and sweeping corn and soybean fields of Illinois, which are broken at regular rectangular intervals by north-south and east-west roads laid out when the land was being distributed to nineteenth-century settlers. The elevation climbs from “a few hundred” feet along the Mississippi’s banks to “more than five thousand feet in the Colorado and Nebraska plains.” To reach California by the southern route, it’s necessary to go over the Guadalupe Mountains in Texas and New Mexico, and through California’s Banning Pass, between the San Bernardino and San Jacinto Mountains. Much of the American West is mountain and desert, “before the strip of intense development” along the coast. This is the view of a pilot who has flown around the country on many hundreds of trips during the past 20 years, since he joined the small set of first-rank writers who love flying. It’s also a noteworthy dispatch from one of America’s great journalists for the past 40 years, framing the subject at the heart of his reporting throughout his career: America’s culture and character. The passage is from the new book Our Towns, the first Fallows has coauthored with his wife, Deborah (Zerad) ’71, after nine books of his own, one he co-authored, and two books of hers. They alternate entries, with the writer of each identified by an elegant tiny graphic. His is a jewel of a plane flying west, the Cirrus single-engine marvel that has transported them around the country. (It’s known for its giant parachute, which can lower the whole plane with four passengers onboard safely to the ground if needed.) Hers is a lithe quill pen gliding east. These ornaments reflect their respective contributions to the book: his, often conceptual, extend his exploration of the country’s nature and his curiosity about how a society, even as small as a town, gets things done; hers, often focused and distinct, show her ear for language and her fascination with manners and mores and with their influence on how people script their lives. The book is a loosely knit narrative about people the Fallowses call local patriots and the broad variety of civic renewal they have helped spur—renewal animated by big plans and game execution, in far-flung places. The book revises Jim’s understanding of American culture. It’s also surprisingly personal. A central thread of the narrative is the flying adventure of exceptional partners who demonstrate, with the originality of their project, the kind of renewal it celebrates. In 2009, when they were both 60, they returned to the United States after four years living in and writing about China. This chapter, while engrossing, was often dumbfounding for them, because China’s culture is so different from America’s. Jim wrote about it in China Airborne (2012). He explored the contrast between China’s success in building its economic hard power (he focused on its construction of 150 major airports) and its ineffectiveness in creating equally successful soft elements, like a reliable rule of law, consistent political standards, and sophisticated coordination among the society’s sectors. They were happy to be back in the United States, even though they arrived when the federal government, other major institutions, and most Americans were reeling from shocks of the great recession. They expected the mood to be somber. What they found was much worse: bottomless pessimism about America’s future. Before leaving for China, they had sold the Cirrus SR20 plane they had owned for six years. In 2010, they bought a Cirrus SR22, an upgrade of the parachute model and the bestselling small plane of its type in the world. They began to head off on excursions from a suburban airport outside Washington, D.C., their on-and-off home for almost five decades. They were starting to explore the country “away from the big, hyper-publicized cities,” as Jim writes in Our Towns, looking for “places that had faced adversity of some sort, from crop failure to job loss to political crisis, and had looked for ways to respond.” This quest grew out of an unexpected stop at the airport in Red Oak, Iowa, a small city in farm country where the population has dwindled from around 6,300 in 1990 to around 5,500 today. In 2013, they began their odyssey in earnest. It lasted, off and on, for nearly four years and covered almost 100,000 miles. They made several visits, totaling around two weeks, to each of 25 cities, and shorter visits to another two dozen. The smallest community, 100 miles beyond Mount Desert Island, which marks the end of the coastal gentrification that starts at Portland, was Eastport, Maine: population 1,400. The largest (an exception to their criteria of medium-sized or smaller cities and rural areas) was Columbus, Ohio, the state capital: population 860,000. The great distinction of this work is that they traveled in their own small plane. They did so for edification (Q: Why do towns in South Dakota come every 10 miles? A: That was a comfortable distance for farmers to cover in the nineteenth century when they delivered harvests by wagon); for convenience (there are about 5,000 places scattered around the country for the public to land small planes); and for beauty (“from the unending fascination of watching the American landscape unfurl as you travel at low altitude”). The upshot, as a map of America in Our Towns suggests, is a buoyant travelogue filled with quiet jubilation: at a time of malaise at the national level, the towns and cities they got to know provide bountiful evidence about the American capacity for local renewal. The map omits the boundaries for states. They are mentioned only as backdrops for the towns the Fallowses visited again and again from 2013 through 2016, from Eastport to Ajo, Arizona, in the remote southwest. The United States they experienced is not the surly democracy that has dominated political conversation, sharply polarized between the largely blue coasts and the mostly red heartland. Their country is a big, open vessel of possibilities that divergent places are realizing wonderfully in their own ways, despite much-better-known troubles. That discovery—largely missing from public awareness—is unexpected, heartening news. In February last year, New York Times columnist David Brooks wrote, “James and Deborah Fallows have always moved to where history is being made.” In addition to their move to China in 2006 to write about its re-emergence, he mentioned earlier moves: to Japan in the 1980s, “when the Japanese economic model seemed like the wave of the future,” and in the 1990s, back to Washington, D.C., “with James writing a series of essays for The Atlantic about what might go wrong if the U.S. invaded Iraq” after 9/11. Luck can also change people, or change the path they are on. In January 1968, Jim was advertising manager of The Harvard Crimson. He was hanging around the paper during reading period, when editors were scarce because they were cramming for exams. One day, there was an explosion at Harvard Medical School. The next, a midnight fire destroyed an economics department building. The following week, some “hoodlums” from a local gang beat up two Harvard students. Jim reported each event and loved it. Those were the first of 85 pieces he did for the paper. By the start of his sophomore year, he had put aside his plan to become a doctor because he found American history the most interesting of the eclectic subjects he was studying. He concentrated in American history and literature, but from that January on, he majored in the Crimson. The following year, he was elected president (publisher and editor-in-chief). He skyrocketed as a campus leader—as a voice who wrote about everything with striking intelligence and often with moral force. As a Rhodes Scholar, he arrived at Queen’s College, Oxford, in the fall of 1970 with the American view that the best background for someone interested in public affairs was training as a lawyer. He discovered that in England, a lawyer is a tradesman, and found studying law drudgery, so he switched to England’s version of training in law in the American sense, by studying economics. After his first year there, and after Deb graduated from Harvard, they got married at Oxford and lived there for a year. As he was finishing up, the consumer advocate Ralph Nader, LL.B. ’58, drafted him to co-write a quickie book about Congress as a corrupt and incompetent institution. On that job, in Washington, D.C., where Deb and he had moved, he heard that Taylor Branch, the future Pulitzer Prize-winning historian and biographer of Martin Luther King Jr., was leaving his position as an editor at the three-year-old Washington Monthly, already a launch pad for American thought-leader journalists. Jim went to see Charles Peters, the founder and editor, and left as Branch’s successor. “It was kind of surprising to me, because I didn’t realize how intent he was on being a journalist,” Deb recalls. A piece of journalism he wrote caught the attention of aides to Democratic presidential candidate Jimmy Carter; in the spring of 1976, they offered him a job as a speechwriter and he took it. To his surprise, Carter won. At 27, Jim became chief speechwriter for two years, until joining The Atlantic as a correspondent in 1979. Except for two years when he was editor of U.S. News & World Report, and the following six months when he worked at Microsoft on a team designing the next version of Microsoft Word software, he has remained at the magazine ever since—in Washington, D.C., Austin, Tokyo, Kuala Lumpur, Sydney, Seattle, Berkeley, Shanghai, and Beijing. According to the magazine’s archivist, he has almost certainly published more pieces under its banner than anyone else in its 161 years: counting articles online and in print, roughly 5,650. He is best known for producing journalism and books that, in his words, answer this question: “What the hell is happening to America?” The first of these articles was unusually controversial and is now a classic example of the journalism of witness. “What Did You Do During the Class War, Daddy?” ran in The Washington Monthly in 1975. In it, Jim argued that he and other privileged young men had been mistaken in believing they were undercutting America’s participation in the Vietnam War by avoiding military service. Instead, he wrote, the class divide meant working-class youths fought and died in Vietnam, and middle- and upper-class youths generally did not. This class divide, he warned, would haunt the United States for years to come. In 1980, Deb published an article in the Monthly that was as self-revealing as Jim’s class-war piece and even more controversial. “Mothers and Other Strangers,” bannered on the cover as “The Myth of the Superwoman,” grew into a book, A Mother’s Work (1985). After earning her Ph.D. in 1978, she worked full-time during the 1979-80 academic year as an assistant dean at Georgetown University and gave birth to their second son. That year, she, Jim, and their first son, who was three, learned that, for them, the intensity of “quality” time did not make up for the quantity lost. Her argument is about why “it was as important, as worthy, for me to spend my time with my small children as to study, do research, try cases, or invest a bank’s money” and why “it was worth it to the children to have me—not someone else—there most of the time.” The book helps explain her less traditional career path. 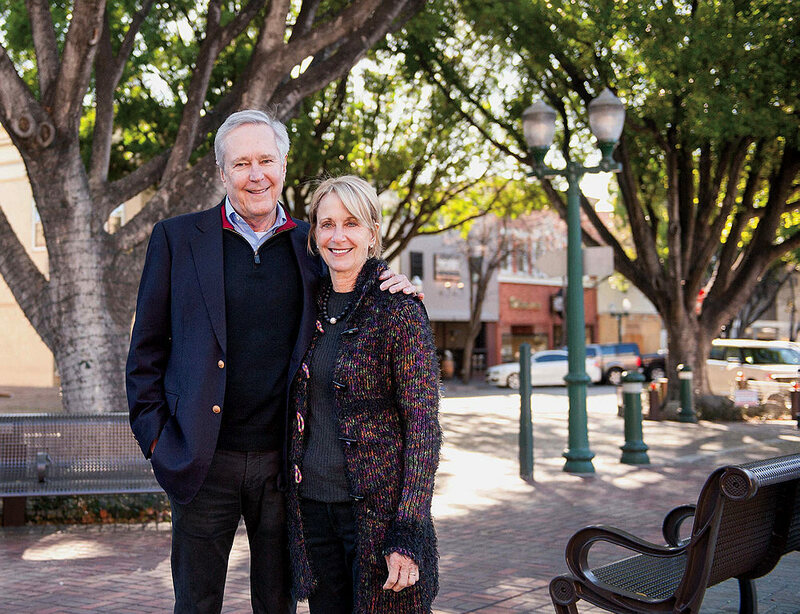 Our Towns is a reflection of the interdependence the couple developed in part as a solution to that problem. Long before this joint effort, Deb shared a lot of the work behind Jim’s reporting and writing, as “the key to everything I have done,” he acknowledged in China Airborne. He shared with her “many of the family responsibilities,” as she wrote in the Monthly and elaborated on in A Mother’s Work. He considered raising their two boys, she said in the book, “more important than his own work, or any other work.” Our Towns is dedicated to their four grandchildren. Air-traffic controllers calmly guide them through airspace, with the neat diction of controllers along the eastern seaboard giving way to southern drawls as they fly south. When they cross the Mississippi, “Jim banked the plane to dip the wing for a good view from my right-side seat.” When there is no chatter from the air-traffic controllers, they listen to Sirius/XM radio, to channels like Road Dog Trucking (“Worst Load Ever” is a favorite show). Deb collects the five-letter names of waystations, where planes turn when on routes set by controllers, reflecting local pride (VOODO in Louisiana), sports mania (BOSOX near Boston), and self-deprecation (DUBYA near Andrews Air Force Base). The Cirrus cabin, unpressurized but comfortable, is about as big as a small sedan’s. The view from it is panoramic. Deb writes: “Seeing Mount Rushmore from ground level almost defies belief. Seeing it from overhead, we agreed, was so great that we shouldn’t really tell anyone about it.” About two hours of flying time to the east of Mount Rushmore, the first Our Towns visit is to Sioux Falls, South Dakota, a city of about 200,000 people spread over about 75 square miles. “The profound impact of the local circumstances—the farm economy, its position as capital of this part of the prairie, its central location within the continent—were ingredients in the economic strategy that made Sioux Falls work”: a counternarrative to the prevailing story about the hollowed-out, left-behind cities and small towns in middle America, Jim explains. John Morrell’s pig slaughterhouse in the city’s downtown was “a high-wage unionized employer for half a century” after World War I and “part of the road to the middle class for people in the area.” Though now Chinese-owned, it still plays a similar role in the local economy. Since the 1970s, the city has also been a major processing center for Citibank and other major credit-card companies. In the 1970s as well, U.S. government security agencies sought a central place for satellite imagery of Earth and located it north of the city in a corn field. EROS—Earth Resources Observation and Science Center—is the world’s largest repository of those digital images. “We weren’t surprised to find that Sioux Falls had become the move-to town for aspiring residents of many of South Dakota’s rural towns,” Deb writes. “What we hadn’t expected was the great number of people in another group, those who were instantly distinguishable from South Dakotans of German and Scandinavian heritage. These are the foreigners, of so many different colors and ethnic groups.” Take the public schools as a proxy: nearly 10 percent of all students were English Language Learners, native speakers of 60 other languages, with their parents working in the meat plant and surrounding community. After a year, they developed a pattern for their reporting. They would usually start at the local news outlet, check out a local brewpub or distillery and the art zone, and ride on bike trails or walk in parks. Deb went to the public library, the schools, civic clubs, and the YMCA or sports center. Jim went to the town’s office of economic development, community college, and tech start-up zone. The Fallows's travels took them to towns and cities as far east as the beautifully situated Eastport, Maine. The most interesting items in between are about stories and leaders. Each place had a civic story to tell, which may not have been “precisely accurate” but gave “citizens a sense of how today’s efforts are connected to what happened yesterday and what they hope tomorrow will bring.” For Allentown, Pennsylvania, for example, it was “walkable manufacturing,” building manufacturing and white-collar workspaces near the downtown. When they arrived in a new place, they would ask, “Who makes this town go?” The answers varied a lot (a folk musician, in a West Virginia city; the commanding officer at a military base, in another southern city), but there was always an answer: a local patriot, heavily invested in helping make a viable future for the place. But he also explains the sources of their optimism. Sioux Falls, South Dakota, a "safe place," may surprise visitors with its economic and demographic diversity. When More Like Us was published in 1989, Jim’s understanding of America started “with the act of immigration—choosing to become an American,” and continued “through the choices and changes that make American life so different.” From going away to college and breaking away from their parents’ class, values, or religion, to having nose jobs and changing their names, Americans, he wrote, did what people in other countries do less often or gleefully. This “peculiar genius” accounted for “some of the bad in America but also for most of the good. This country is the world’s demonstration of how people behave when the usual limits are removed.” Immigrants, he reported after surveying the data, had long helped expand the American economic pie for everyone. But, he warned, “America will be in serious trouble if it becomes an ordinary country, with people stuck in customary, class-bound roles in life.” And he saw signs of “cultural danger” in “the three forces that now most significantly affect the sense of possibility—of upward mobility—in America”: immigration, education, and the nation’s democratic character. Immigration was straining American politics because of “Fear of the Other,” as Jim called it. Language posed the most obvious threat. Half of America’s immigrants were said to be Spanish-speakers, leading to charges they were “diluting the sense of Americanness.” There was no evidence they were doing that any more than Europeans did when they were almost nine of every 10 immigrants to the United States in the century between the mid 1800s and the mid 1900s, when America “emerged as the strongest, most dynamic, and most open society in the world.” But because of the anxieties that immigration stirred, it threatened to undo this element of the American experiment. Education—its purpose as well as quality—was also a major advantage of America over other countries. It was about self-definition through self-improvement. One of the country’s great achievements was the creation of colleges and universities that generated knowledge as well as educated and skillful graduates. Another was the creation of corporations that turned that knowledge into innovation, in Silicon Valley, around Boston, and elsewhere. Yet by the time Jim arrived at Harvard in 1966, “the formula for success and mobility” had changed. The education system was now a status-conferring system, too, “implying that people with more brains and more schooling are better people” and corroding that foundational democratic character. Jim concluded, “The idea that people on the top of a society are better than others—not just richer or luckier but better inside, because they’re white or smart”—discouraged people at the bottom and made people at the top risk-averse: “It isn’t the American way.” He warned against sorting Americans by who they are in terms of race, wealth, religion, ethnicity, family, and so on, and emphasized the importance of judging individuals by what they do, say, contribute, and aspire to, not by the circumstances they were born into. In the national narrative, Allentown, Pennsylvania, is a statistic in the tally of battleground states and electoral votes; on the ground, Our Towns depicts another kind of story. A generation later, More Like Us reads like a prophecy. America is far more beset by these fundamental woes, leaving far too many people to doubt they have a fair chance to improve their lots in life. By and large, the Trump administration, playing on the resulting tensions that Jim foresaw, is doing, or seeking to do, the opposite of what has long struck Jim as in the country’s best interests. Our towns provides a lot of anecdotal evidence that, despite this oppositional effort and the serious threats it poses to the United States, towns in this country are renewing this sense of possibility from the ground up. That’s happening because many Americans are renewing themselves, in ways the Fallowses, as they approach 70, demonstrate in their own lives in Our Towns. When Jim wrote about American progress before now, the nation was the community. He focused on the need for the national government to provide motivation and opportunity for self-improvement. Now, it’s small communities and the individuals in them showing the ingenuity, resilience, and self-sacrifice that have typified America during great crises. “Suppose that you are skeptical of this fundamental claim, about the ongoing health of local American society,” Jim writes in The Atlantic. “I suggest the following test…: Through the next year, go to half a dozen places that are new to you, and that are not usually covered by the press. When you get there, don’t ask people about national politics…if it’s on cable news, don’t ask about it. Instead, ask about what is happening right now in these places. The schools, the businesses, the downtowns, the kind of people moving out and the kind moving in, and how all of this compares with the situation 10 years ago. See where that leads you. This process, repeated again and again,” led the Fallowses to the optimistic conclusion they reach in their book. Contributing editor and journalist Lincoln Caplan ’72, J.D. ’76, who is a senior research scholar at Yale Law School and the senior editor at the Knight First Amendment Institute of Columbia, is a longtime friend of James and Deborah Fallows. “The Justice Gap,” his feature on legal services, appeared in the November-December 2017 issue.